This Sleep & Beyond Organic Wool Comforter is filled with their exclusive USDA Certified Organic Superfine Merino Wool and are covered in 300 Thread Count Pure and great for skin Certified Organic Cotton Sateen. 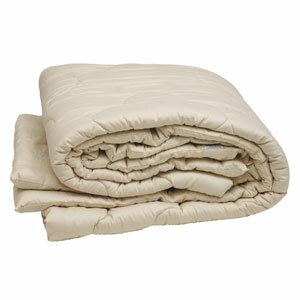 Enjoy a better night sleep with the Sleep and Beyond Wool Comforter tonight. S&B™ prides ourselves to be the experts in organic and natural wool filled bedding and beyond. S&B™ dance our way to work because we love what we do and have been perfecting our products since 1992. Only the finest and purest nature created raw materials, such as organic Merino wool, natural Shropshire wool, and organic and natural cotton, are used to create each master piece. S&B™ raises their own Merino sheep in the mountainous lands of Kyrgyz Republic, which produce superfine organic wool for myMerino collection. S&B™ considers themselves to be a fair trade employer by paying fair wages to its factory workers, providing great working conditions, and never involving child labor. Products are tested to be free of arsenic, VOC’s and other carcinogenic chemicals that are used in majority of the conventional bedding such as down, polyester and silk. Products carry the most stringent certifications (USDA Organic, Oeko TEX, Woolmark, and GOTS) to back up our statements such as “100% natural” or “100% organic”. By purchasing S&B™ bedding, you support many local economies around the world, protect the environment from pollution, promote balanced eco system and prolong your health. King (100x86) 7 lbs of merino wool fill. Step 1: Un-make your bed at least once a week to allow trapped moisture to be released, refreshing you bedding. Step 2: Regular sunning and airing. The sun naturally revitalizes and disinfects wool bedding. Spot clean with a soft brush and mild detergent and water. Allow product to air dry completely. Vacuum from time to time. Free basic ground delivery within the Continental United States. Additional charges apply for shipments outside the Continental USA. Items Ship in 1-2 days. Additional charges apply for Hawaii, Alaska or overseas shipments. Ships via UPS ground service. Due to the hypoallergenic nature of the products and bedding law regulations, items that have been used, laundered, or are not in original packaging are non-returnable. Call for more information: 866 388 5154. Call our customer service department at 866 388 5154. We're here to offer helpful advice on a comforter that is best for a great nights sleep.